The”Learning Design for a 21st Century Curriculum” MOOC starts today and runs until 13 March 2013. It is funded by JISC and offered by Open Learning Design Studio. It is expected that each week will need 3-10 hours. So it started with a five minute video and then a 45 minute discussion. Then you have to introduce yourself, before setting your personal learning objectives for the week. A quick post to your learning journal and the first days activities are done. The five minute video was only 3 minutes and was pretty light weight, just told you what you had to do in week one. All pretty good so far. Next I registered with Cloudworks as instructed in one of the getting started links. The registration process was seamless, and then you are presented with a busy page which I guessed I should click on the OLDS MOOC launch event. I found a “follow” button and a “mark as attended” button. There was a video link of a feed welcoming people to the course. The feed was low quality and the volume was extremely low. It was very hard to stay engaged when you couldn’t hear clearly. Whilst watching the video I setup my first cloud to act as a learning journal (oh, such multitasking, how do I stay on task?) and have added it to the Cloudscape for the OLDS MOOC. One of the things being discussed in the video is “Disrupting ourselves: the problem of learning in higher education / Randall Bass“. Engaged again as the presenter talks about the importance of the role of a university in leading students to become concerned citizens. One of the resources provided was http://curriculumreform.org/curriculum-reform-manifesto/ for those interested in looking at what was being discussed. What is the purpose of education? I is a question of design. The presenter sees: craft as making good stuff; and design as making stuff better. Design is about change and about innovation. Learning design is then looked at more indepth. There was some discussion of Instructional Design as a linear approach. Refer ADDIE model for example. Educational Design Research is a methodology for the study of function. In Educational Design Research you have a theory of how people learn and you explore that theory in real life conditions. Learning by Design has some affinity to inquiry learning. Teachers as Designers suggests developing a design attitude allows teachers to integrate theory better into their practice and be more reflective practitioners. The presenter recommends reading the “Teaching as a Design Science” book by Dan Laurillard (2012). The presenter takes us through the OLDS MOOC weekly topic progression to show us a bit of a roadmap for the MOOC. This part of the video was quite useful to get a feel for where we are heading. I paused the video repeatedly during the morning. It was 52 minutes long, but I actually took about three hours to watch it as I was multitasking, trying to do the other tasks for the MOOC and deal with a few interruptions in the office. The hardest part was the volume issue, which had me almost give up. 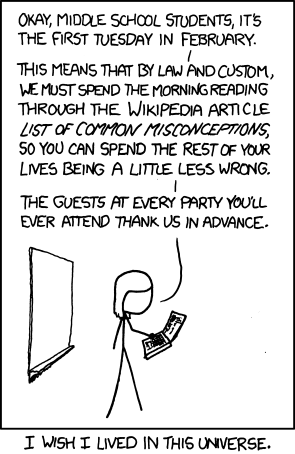 The XKCD comic at about 38 minutes of video helped (as XKCD always does). The last few minutes were dedicated to questions, but with timezones and the crazy busy internet, I didn’t actually know when this was live streamed! I guess that is the case for a lot of participants to be honest. So even watching it on what is officially the first day, I missed the live stream by several days, sigh. So, lots to learn over the MOOC, and lots to do. What do learners DO online? Why do we need Mahara when we have Moodle?